Like many jurisdictions around the world, Tennessee requires everyone to report suspected Elder Abuse. 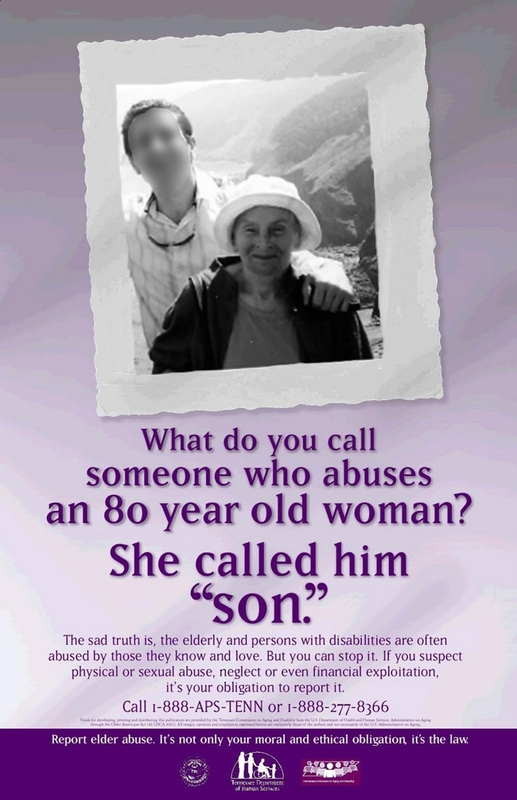 Ireland has no mandatory reporting laws for Elder Abuse, or even Child Abuse. Doctors, teachers, priests, Gardai, solicitors, social workers, nurses, friends, neighbours, family – no one in Ireland is under any legal obligation to say a word. Perhaps that is why an old man can be punched and kicked in front of his house by his abusive son in broad daylight and passersby do nothing, say nothing. Maybe that is why a sister can witness her brother hold her tiny mother in a headlock and watch her face be broken by the repeated pummelling of her brother's fist and remain silent. Perhaps it is why even when a doctor is made aware of an abusive situation, she says nothing when her old patient has broken bones, bruises, burns, cuts. Maybe it is why an elderly woman's solictor, knowing of terrible physical and financial abuse against his client takes no action, takes no care, takes no questions. These examples are not figurative; they are real life, real victims, and real people who made a clear choice to do nothing. We have presented information regarding Dolores' gravesite in Dolores' Grave and in Dolores' Grave - Update, and readers of this site are certainly encouraged to read those pages first for background. This update is in two parts; on this page we will relate the circumstances regarding the purchase and erecting of the headstone on Dolores' grave, and in Part Two we will focus on events surrounding it after her death. In Dolores' Grave - Update we see this image of Dolores' headstone. We call attention to the white plaque on the lower left, ostensibly showing the monument company that was responsible for the headstone and kerbing. The plaque itself is unusual. An exploration of Deansgrange Cemetery revealed no other plaque or advertising like it on any grave. Some graves had the name of the monument company discreetly engraved on the back of the headstone, or on an unobtrusive location on the kerbing. This plaque has the feel of an auto dealership sticker on a used car. RE: My plot 68B St. Mary's. As stated previously, we believe that Dolores was unaware that this transfer took place. Grave Transfer Receipt. Although this fireplace company no longer deals with headstones at all, at the time they would supply, but not erect headstones and kerbing. The person who actually installed the memorials for them was Ethan's long time associate Rory Mulhall. The cemetery fees (for the foundation, etc.) were paid on 16 April 2010. Cemeteries such as Deansgrange require insurance, registration information, etc. before they will approve the contractor to do work on a gravesite. Plans were filed with the cemetery and the permit was issued to erect the headstone and kerbing on Dolores' plot on 21 April 2010. Here is a close-up of the plaque on the headstone. Curiously, the plans were not filed by “Alpine Memorials” of Glencullen. The permit was not issued to Alpine Memorials. Alpine Memorials is a fictitious name. It does not exist. Irish companies are required to register themselves with the Companies Registration Office unless they are trading under the owner's true real name. A company named “Celtic Computers” would be required to register. John Butler, if he sold computers and traded under the name “John Butler” would not have to register. If he traded under “John Butler Computers” he would have to register. And if you publish a newspaper you have to register, full stop. So a company named “Alpine Memorials” would most certainly have to be registered. It is not. Nor is the staff of Deansgrange Cemetery familiar with Alpine Memorials. (In fact, the employees at Deansgrange Cemetery had quite a chuckle about it, using the term “cowboy.” This is equivalent to the American term “fly-by-night.”) The Post Office sorting centre that services Glencullen is not aware of “Alpine Memorials.” Glencullen's Post Office is unaware of it. The postman who delivers Glencullen's mail never heard of it. The plans, which were hand drawn on a single sheet of paper were submitted by Rory Mulhall of Glencullen using a business that actually is registered by Mr Mulhall – R M Stoneworks. It was registered on 12 August 2005, the very same day that Ethan took possession of the house in Finglas he had forced Dolores and Cecil to purchase for him. Curious. R M Stoneworks is a small one-man operation. Rory Mulhall is described in various places as a “building contractor” and “stone mason.” Why did Mr Mulhall and Ethan go to the trouble to have this one-off plaque with a false business name made? At this point, we speculate that because the grave transfer and erecting of the headstone was a secretive affair, the gaudy Alpine Memorials plaque with the phone numbers displayed so prominently would serve as a way to keep this secret under control. Any of Dolores' children who might visit Cecil's grave would be surprised to find the headstone there. They would not be able to ask Dolores about it; she was isolated from family contact by Ethan. Calling the non–existing “Alpine Memorials” would put them in contact with Rory Mulhall. It is believed that although Dolores had no knowledge of these events, it was of course her money that paid for it all. As seen in Dolores' Grave, two months after the transfer a letter was sent to Damian Brass concerning the plot that Dolores would be buried in. A scenario was created by Ethan where he not only had possesion of the empty plot beside Dolores' future grave, but he claimed to have final say on who else could be buried with her. Ethan sought to circumvent any of Dolores' children having anything to do with her funeral or burial. This included her oldest son Nathaniel who had been previously designated to deal with the funeral arrangements, plot and gravestone when both parents had passed away. Starting after Cecil's death, the HSE was informed that all of Dolores' children lived abroad except for Ethan. Starting no later than late 2009, Ethan started to proclaim that he had Power of Attorney over all of Dolores' affairs, including her medical decisions. Ethan also started identifying himself as Dolores' sole care-giver in 2009. If he was unreachable, medical personnel were to consult with his associate and Ethan-designated “family spokeman” Lloyd Montgomery. Dolores' other nine children were never mentioned. Ethan was well practised and successsful in posing as “Dolores Maxwell” in correspondence to her solicitor, the HSE, and her financial institutions, to name but a few. Ethan tried very hard (and was almost successful) in hiding the fact of Dolores' admission to the hospital in a critcal condition on 26 September 2010.